The actress was thrilled to be cast in the famous puppets' new movie, but admits she was overwhelmed when she got close to the characters she had loved as a child. She said: "It's so odd to be suddenly doing a scene with a character you adored as a kid. I've been most star-struck with Fozzie. I was really into him and I do a pretty mean, 'Wacka wacka!' 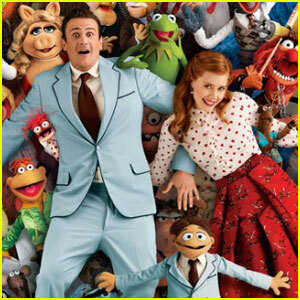 "
Jason Segal is responsible for bringing the popular characters back to the big screen and admits celebrating his birthday on set was one of the greatest moments of his life. He told Empire magazine: "Let me tell you about one of the best moments of my life. "Near the end of the shoot, we closed down Hollywood Boulevard and filled it with hundreds of extras. It was also my 31st birthday that night, and all the Muppets sang me 'Happy Birthday'. "But what was really crazy was that on the street there just happened to be a huge banner with Jim Henson's face on it – not set dressing, but advertising an exhibit going on at the museum. He was looking down at us from the banner and it felt like … Everything felt like it was coming together."